Below you will find instructions on how to use the search options in MTurk and how to install Chrome browser extensions and scripts. These are the tools you need to maximize your earnings from Amazon Mechanical Turk. When you begin with MTurk one of the first things you will do is go to the HITs tab to see what you can start doing right away. And then you might be overwhelmed by the number of HITs that appear. Page after page of seemingly similar HITs that are of no interest to you. So where to begin to start making sense of it? Check the box next to “for which you are qualified” then enter 1.00 in the box “that pay at least $”. Next choose “Sort by: HIT Creation Date (newest first)”. When you press the GO button you will see a list of HITs that pay at least $1.00, all of which are available to you. There are only 10 HITs displayed on the first page so make sure to go through all the pages by clicking Next. Check the box next to “for which you are qualified” then enter 0.50 in the box “that pay at least $” and type “survey” in the “containing” box. Next choose “Sort by: HIT Creation Date (newest first)”. When you press the GO button you will see a list of HITs that contain the word “survey” and pay at least $0.50, all of which are available to you. There are only 10 HITs displayed on the first page so make sure to go through all the pages by clicking Next. Check the box next to “for which you are qualified” then enter 0.00 in the box “that pay at least $”. Next choose “Sort by: HITs available (most first)“. When you press the GO button you will see a list of HITs that are offered in batches (HITs Available would be more than 1), all of which are available to you. There are only 10 HITs displayed on the first page so make sure to go through all the pages by clicking Next. Once you are familiar with the types of HITs available to you, check what HITs are there when you leave the box next to “for which you are qualified” unchecked. Note: If you have multiple browser tabs with various MTurk searches: when you change “Sort by:” in one of them that may change the value in all of them. It is weird but is happening to my Chrome. If you want to see a particular HIT that appears in the search results right click on “View a HIT in this group” and choose to open it in a new Tab or Window. This way you won’t lose your search parameters. If you like to try the HIT you are viewing click “Accept HIT” a the top of the HIT window. If for some reason after staring on the HIT you decide you don’t want it after all, simply click “Return HIT”. Returning HITs is something people do all the time and this will not damage your reputation on MTurk. Once you start working on MTurk you develop a desire to keep track of the HITs you already have done so you don’t accidentally do the same HIT again. Some requesters do a check to prevent you from doing so and not being paid but not all of them do it. This is where the MTurk HIT Database comes to help. It is a script that creates a table with all the HITs you have done. All you need to do is hit a button. The next thing you wish for is a way to automatically detect new HITs if they are above certain value. And sometimes you wish that you were faster to grab a high paying HIT that was no longer available when you clicked “View a HIT in this group”. After not succeeding for some time I finally managed to find a solution for the above problems. Since I am not planning to make a living off MTurk I am happy to share my insights and hacks here. There are number of scripts and extensions that can be added to the Chrome browser. If you are using another browser I would suggest that you also install Chrome and use it when working on Amazon Mechanical Turk. Begin with installing the three extensions below and make your life on MTurk much easier. Provides useful information about requesters; displays a little red triangle next to each requester’s name so when you move your mouse over it you can see the stats for the requester. Before the name of each requester you will see a red triangle. Move your mouse over a red triangle to see the stats for that requester. Refreshes a page at specified intervals and can play a sound if a specified string is found. Once it is installed you will see its icon in the top right corner of the browser window (to the right of the address bar). If you want to be notified when something specific is found you can enter a regular expression in the “Page Monitor” box. See below for examples. To change the notification sound or when to be notified right click on the icon and chose Options. An extension that allows you to install user scripts one of which is MTurk HIT Database. Choose “Add a new script”. If you choose “Get a new script” you will get an error because the default website http://userscripts.org is no longer functioning. Click Save button in the Editor. You need to do this in order to be able to type anything in the editor. Find the code of the script you want to install on the web and copy it. Paste the script in the Editor and press Save button again. In the dashboard window you will see a list of installed scripts. If a script is not running there will be a red circle before its name. Click the circle to make it green and run the script. To stop it click the circle again to make it red. Go to http://pastebin.com/fQwr2C9G and copy the HIT database script code. Follow the procedure for installing a new script described above (How to install a script in Tampermonkey). After you save the script it automatically gets the name MTurk HIT Database. Go to Tampermonkey’s Dashboard and start the script (see How to run a script in Tampermonkey above). Go to Your Account –> Dashboard on Mturk. At the bottom of the page you should have a new table with a green title area labeled HIT Database. Choose “ALL” instead of “Pending Approval”. Click “Update Database”. Wait until the database gets updated. Type a keyword in the “HITs matching:” box. The keyword might be the name of the requester or part of the HIT’s name. Click Search button. A new window will open with a table containing all matching HITs. Go to HITs tab in MTurk. Under each HIT you will see two pink boxes. R is short for requester, T is short for HIT. If the R box is green you have done a HIT by the requester. If the T box is green you have done a HIT with this name. You may have noticed that the higher paying HITs do not linger for long. In order to grab them you have to constantly refresh the web page. This is not very practical but there is a way to do it automatically with Auto Refresh Plus. Check the box next to “for which you are qualified”. Sort by: “HIT Creation Date (newest first)”. Enter 0.00 in the box “that pay at least $”. Click the GO button to execute the search. Click the Auto Refresh Plus icon. Choose 20 seconds as refresh interval. You can choose to refresh more often but keep in mind that if you do it too fast the browser will freeze. You need to give enough time for the search results to load before the next refresh. Press Start to start Auto Refresh Plus. Note: When the text is found and the notification appears Auto Refresh Plus stops working and you have to restart it again. Everything that you entered is there, all you need to do is press the Start button again. What does this regex mean? tells the Auto Refresh Plus to stop and notify you (by a popup and/or sound) when it finds one of the texts $2 or $3 or $4 and so forth on the page. The backslash \ is used to escape the dollar sign because it has a special meaning as a command in the language of regular expressions. The vertical bar is the sign for OR. These settings will trigger the notification at any time when a HIT over $2.00 appears on the page. I intentionally exclude the \$1 due to many annoying HITs that are $1.00 and trigger the notification pretty much constantly. Instead, I manually search for HITs paying at least $1.00 in another window when I don’t have anything else going on. Sometimes there is a way to get such fleeting HITs. It will not work for every such HIT but for many will. Look at the address bar in the window where you see the above message. Press Enter to load the new address. 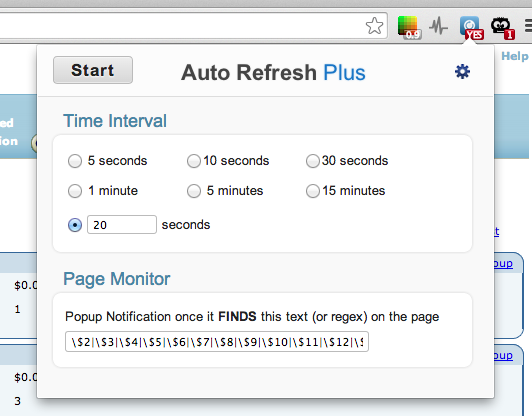 Click on the Auto Refresh Plus icon and choose the refresh interval to be 5 seconds. Type a word or two from the requester’s name or the HIT name in the Popup Notification box to be notified when the HIT is captured. This step is optional if you are in a hurry to start catching. If you don’t do it the Auto Refresh Plus will continue refreshing the page even after it captured the HIT. You have to be checking HITs –> Hits Assigned To You on MTurk occasionally to see if you caught the HIT. When you do just close the tab (window) where you had the Auto Refresh Plus running. Good luck snapping those fast moving and high paying HITs. Thank you so much for posting this. I finally managed to get one of those fast moving hits. I never tried before because i didn’t know how. thanks again.